Update: I can no longer recommend the use of sunless tanners at this point as new research has come to light since posting this review. The second ingredient in this product is Dihydroxyacetone (DHA) which is the developer, and has been linked to genetic alterations, DNA damage, and cancer. Up until now, the biggest concern has been the inhalation of this chemical (even though it is naturally derived) but now it seems DHA might be able to penetrate deeper into the skin unlike previously thought. Since one typically applies a great deal of self tanner onto most of their skin, this worries me and I am not willing to take that risk or endorse the product. The gals at No More Dirty Looks have done an excellent job of breaking down this concern and I encourage you to read this post and to do your own research to determine your comfort level in using Chocoalte Sun, or any other self-tanner. In the past, sunless tanners had never appealed to me. I felt like they would take too much time and I didn’t want to incur the risk of streaking and turning orange. Hence, I steered clear. Then I came across Chocolate Sun’s Shea Sunscreen for Body SPF30 at the SpiritBeautyLounge website and promptly ordered it. When that purchase was a success, I figured their Cocoa Glow Sunless Tanning Cream would be worth a shot and while I was at it, I gave Cocoa Illume For Face a trial run as well. Here are a few important details before I get to the self tanner review: my skin is light to medium and olive in tone, so I chose Cocoa Glow which is their sunless tanning cream for medium tones. The “lite” is for paler skin and “absolute” is for darker skin tones. The Cocoa Illume for Face comes in light and medium/dark, so I opted for the light. I hinted in my previous Chocolate Sun review that my sunless tanning experiment went very well, and indeed it did. The body cream is applied with ease, just like a daily body lotion. I use one pump per leg, and one pump for my arms, chest and upper back. I have used the body cream at least 4-5 times and have never had any streaking, only a lovely sunny glow sans orange. The Cocoa Illume for Face is just as simple to use. I’ve applied it three times, after washing my face in the morning and again, no streaking to be found. The Cocoa Glow Sunless Tanning Cream has a pleasant, albeit strong scent of bittersweet cocoa butter that lasts for several hours. The ingredients in all of Chocolate Sun’s products are 100% natural and the “developer” in the sunless tanners is derived from beets. The bottles have extensive application directions on the labels which I find much more practical than searching for a pamphlet each time I put it on. (I like to refresh my memory regarding their recommended techniques while I’m in the newbie stage). But in reality, the directions are almost unnecessary as they are so easy to use. Cocoa Glow Sunless Tanning Cream is available at SpiritBeautyLounge, $40 for 8oz. 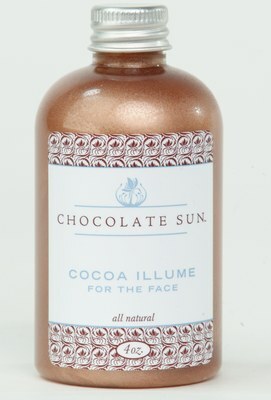 Cocoa Illume For Face is available at SpiritBeautyLounge, $17 for 2oz. Disclosure: Samples from SpiritBeautyLounge were provided for this review. The opinions in this review are my own. I was not financially compensated for this review or any other. Previous Post The winners of the Aftelier giveaway! I’m actually very pale so can’t go much in the sun and even when I do, can’t get much of a tan, so I use self tanners lately (otherwise I just don’t look healthy in the summer). These sound very good- do they smell chocolate-y too? It’s more cocoa butter than straight-up chocolate. I don’t mind the smell, and have grown used to it at this point, but it’s pretty strong. It works so well though, that I can live with it! Thanks for the review. I am a ex-sun worshipper with multiple removals of irregular moles. So far all the moles have been benign but now I have to love the sun from a distance and with protection. I have been looking at Chocolate sun for a while wondering if they had great products. The lotions you used sound perfect. I am excited there is no orange streaks and it’s easy to use. Too good to be true. I think I will be breaking down soon using my 10% discount from Spirit Beauty Lounge. I will also purchase the Marigold sunsceen and shea body too, a natural SPF of 30 is fantastic. And the sunless tanners (while not necessities like the SPF) are also top notch. I can’t really compare them to others, but I love that they are so easy to use and that they are all natural. Let me know how it all works out for you! This does sound very interesting. I am also very pale like Ines and I find fake tan is even more orange on the pale. There is also the question of the scent but that sounds like it’s good. I like that there is a natural option to try. I actually don’t mind being pale much of the time- and it really is Nicole Kidman pale- but you really need to think about what colours you wear and legs are always a real problem. And I hear you on the legs thing! When I tried on a skirt with no tights this spring, my legs were so ghostly pale (and ghastly) that they scared me!! The ingredients looks really great and I am a stickler on ingredients. but…. I saw something called emulium delta that I didn’t know so I did some searching and found that this was a trade name for cetyl alcohol & glyceryl stearate & PEG-75 stearate & ceteth-20 & steareth-20 from a company called Gattefosse. From what I have read, this is what legally should be included in their ingredients. Also, there are some problematic synthetic ingredients in there. Seems Chocolate Sun is not being honest which is troubling.